Sales professionals are driven and require fast, reliable, instantly available tools to do their jobs well. The capabilities in Sales Meeting make this possible with voice text conversions, camera, scanning, calendar, contacts and online data exchange. Map navigation can be integrated to alert you of traffic jams or detours ensuring that you arrive at your meeting well prepared and on time. Success is not a one person show. Effective teaming and collaboration is needed to deliver the very best product or solution to meet your customer’s needs and requirements. 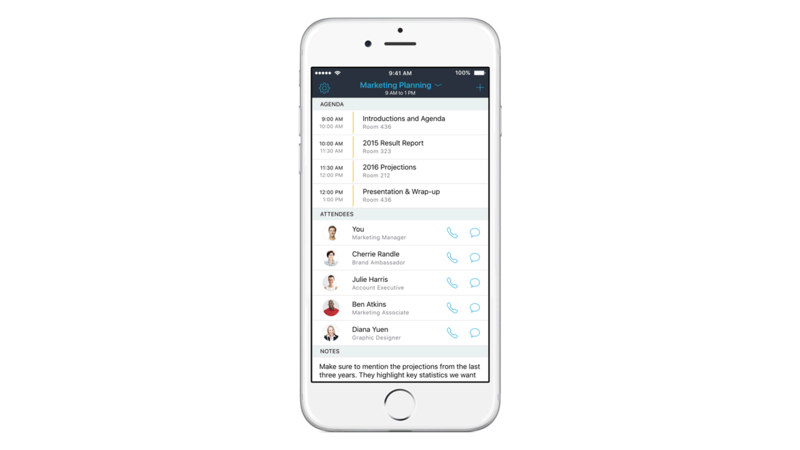 The Sales Meeting app gives you what you need to quickly collaborate with team members and automatically schedule follow-up meetings through the Calendar and Contacts integration. You can also access recommended offerings, sales collateral and engage with Subject Matter Experts invested in the client and your success. Details are important but so is the “big picture”. Brainy supercomputer Watson picks through Internet users’ public social media posts to learn about individuals. Using what it learns, it creates a bigger picture providing you with intelligent insights about your customer. Powerful analytics summarizes customer intelligence you can use to make recommendations and improve your overall meeting effectiveness. Stay on top of your business travel itinerary, from end-to-end.